Love covers over a multitude of sins. Let us love as God loves, for God loved us first. Love will win the day. Love will triumph in the end. In our popular songs, imagination, and scripture, we believe in the triumph of love over all. We celebrate that love will win the day. We believe in the power of love that can, in the words of Huey Lewis, “make one man weep and another man sing.” We understand that God is love, as 1 John tells us. If only the world would love, if only everyone would love each other, according to The Beatles, we’d come together, right now. We’d also be fulfilled and whole as a community and as individuals. Mumford and Sons rightly states that “love, it will not betray you, dismay nor enslave you, it will set you free to be more like the [person] you were made to be.” Truer words are hard to find. Indeed, all you need is love. Popular culture calls for it. Our scripture speaks of it. We feel it. Foreigner may say they want to know what love is, but we know: it’s the truth of life, the undergirding of our souls, the beauty of the world, the reality of Christ among us. Division, we know, stands in contrast to love, for love builds up unity. In the love of Christ, we’re all called together into one household. Christ has brought everyone together, those far off and those near, those once strangers are now citizens and saints. Paul paints a beautiful picture of unity for the whole church in our scripture this morning. His vision is one where no one is excluded, where everyone who calls on the name of Christ is at home in the church, where division ends and unity reigns. The church in Ephesus has a question, though. Really, it’s a question that faces, perplexes, and divides the early church: did Christ come only for the Jews, first for the Jews, or for Jews and Gentiles equally? The question centers on the status of Gentile believers. Remember, a Gentile is any non-Jew. Christianity is exploding among Gentile populations, so the question is pertinent to the growth of the church. Differing answers to the status and role of Gentiles by teachers like Paul, Apollos, and Peter threaten division within the church. And so, Paul writes his answer to the question of the status of Gentile believers in the church by stating, clearly, that they are equal, for there is no longer Jew nor Gentile, but only one common identity in Christ. So, then, remember that at one time you Gentiles by birth were called “the uncircumcision” by those who are called “the circumcision”–a physical circumcision made in the flesh by human hands–remember that you were at that time without Christ, being aliens from the commonwealth of Israel, and strangers to the covenants of promise, having no hope and without God in the world. But now in Christ Jesus you who once were far off have been brought near by the blood of Christ. For he is our peace; in his flesh he has made both groups into one and has broken down the dividing wall, that is, the hostility between us. He has abolished the law with its commandments and ordinances, that he might create in himself one new humanity in place of the two, thus making peace, and might reconcile both groups to God in one body through the cross thus putting to death that hostility through it. So he came and proclaimed peace to you who were far off and peace to those who were near, for through him both of us have access in one Spirit to the Father. So then you are no longer strangers and aliens, but you are citizens with the saints and also members of the household of God, built upon the foundation of the apostles and prophets, with Christ Jesus himself as the cornerstone. In him the whole structure is joined together and grows into a holy temple in the Lord; in whom you also are built together spiritually into a dwelling place for God. This is a beautiful text. While controversial at the time for calling for full inclusion of Gentile believers, today, with that debate behind us, we read it as a wonderful statement of what it means to be unified. Pauls says that we are all, who call on the name of Jesus, being built into a metaphorical temple that will glorify God and serve God’s purposes. For no one is far away from God; we are all citizens and saints, brought together by Christ. We all love Christ and that’s enough to unify us together, just as it was for Paul. Indeed, all you need is love. For love is love. Except, I’m sure you recognize the second phrase as a partisan one. Love is love. That’s been the rallying cry of LGBT activists for some time. The statement is loaded, for it states that two men loving each other in a committed relationship is the same as a man and a woman loving each other. Love is love seeks to be unifying but, we know, it’s actually divisive, for it speaks to a partisan agenda. Pride month was last month and, if you watched the news or paid attention, there were picket signs stating Love is Love and other similar slogans declaring the primacy of love to conquer over hate, with those who disagree with gay rights being the haters. Turns out, love isn’t quite so unifying after all. Just like Paul’s statements here in Ephesians. Comments like these got him in trouble with Peter, who hauled him back to the temple in Jerusalem to talk about his radical teachings about Gentiles. Peter, and several of the apostles, didn’t take kindly to Paul’s radical inclusion. Such beautiful and wonderful words as Paul writes here were divisive, just the way love is love can be divisive today. And there are other ways, too, that we divide ourselves over something that seems beautiful and wonderful. For example, what makes a Christian? Paul says that all those “in Christ Jesus” are equal, regardless of Jewish or Gentile ancestry. Today, how do we define who is “in Christ Jesus,” as Paul says? Born again believers who have prayed the sinner’s prayer? Anyone who attends church? Anyone who lives in the world because “Christ died once for all, for the righteous and unrighteous to bring you to God,” as Paul says elsewhere in his letters? Baptized believers, even if they haven’t confessed Jesus on their own? And then, does baptism count if you were baptized as an infant? Do you have to confess Jesus in order for the baptism to be real? Do you need to be baptized again in order to join the church? If you’re baptized in a methodist church and decide to join a baptist church, is it right that you be baptized again? Who’s the real Christian? When Paul says those “in Christ Jesus,” who exactly does he mean? Even deciding who counts as a Christian, turns out, is a divisive issue! At a fundamental level, Christians have division. In the time I’ve lived here, I have often gotten questions from members of this church and from community members about theological differences between us and baptists, the prevailing form of Christianity in our community. That question centers on two concepts: God’s sovereignty and predestination, for those are two essential tenets of Reformed theology, which includes baptists. For us, they’re not as essential and we tend to think differently about those topics, which is what raises the question. Those two concepts, among others, divide us Wesleyans in theology, like us methodists, from those of a Reformed theology, like baptists and presbyterians. History has also divided us, a history that’s over five hundred years old. We come ultimately from the Church of England, which split from the Catholic Church when the pope wouldn’t give King Henry VIII a divorce from his first wife. Baptists come ultimately from Martin Luther, who began trying to reform the Catholic Church and ended up founding his own church, the Lutherans. Such issues are long gone, but the theologies derived from that five hundred year history continue to offer sources of division. And not just theology, but other issues give rise to division among us within even our own community. Is Christianity predominantly about focusing on condemnation of sins so that you realize how much you need Jesus? Or is it about promoting a lifestyle of holiness that makes you look more and more like Jesus to spread love? Or is it about defending a particular conservative morality so that our nation will be blessed? Or is it about finding peace and solace in our relationship with Christ? Or is it about serving our community? Depending on the church you ask in this town, you’ll get a different answer. At a fundamental level, even among the churches in our community, we understand the reason for following Christ differently. So who is the real Christian? Which church is right? Which theology is right? What is Christianity really about? In light of all this, all you need is love? That certainly seems naive considering the significance of the differences that divide us or threaten to divide us. Seems we need more than love. For moving the fence stands in contrast to the temple in Jerusalem, the one Paul alludes to in our scripture this morning. In the temple, anyone could cross the threshold inside the first wall. But they’d quickly encounter the second wall, on which there were signs in Greek and Latin, the language of foreigners, those far off, which said, “Let no one of any other nation come within the fence and barrier around the Holy Place. Whosoever will be taken doing so will himself be responsible for the fact that his death will ensue.” Such a stark warning was placed all the way around this inner wall like a fence, declaring that only Jews need apply themselves to that inner sanctum. Religion was restricted, relationship with God had firm barriers erected. To that, Jesus said, all you need is love. The priest in the story of the French soldier initially responded like the signs in the temple: beliefs formed a barrier. What mattered most was upholding the right belief, moreso than loving. The story makes clear what Paul says in the scripture: Jesus has turned that equation on its head. Now, loving others and finding common unity together matters more than upholding the right belief. But, we have proven that love itself is divisive. We’ve also proven that defining a Christian is divisive. So how are we to ascribe ourselves to Paul’s writings here? How is it possible that all you need is love? Can unity as Paul declares it really be possible? This is not an academic question, as we’re all too aware. I mentioned the LGBT community earlier in this sermon very much on purpose because it’s the issue of gay marriages and gay ordinations that threatens the unity of the The United Methodist Church. That’s an issue we’ve explored together in various formats and one we continue to monitor. And indeed, it’s a significant topic among us as web traffic shows. The post I added mid-week updating us on the denomination’s plans and status had significantly more traffic than any other recent post. We are monitoring because we are a mixture of worry, interest, fear, concern, and hope, for out future as United Methodists. And the question for us, very much related to this scripture, is the same as it was for Paul’s original audience. What does it mean to be unified? Is unity possible when division threatens, whether over LGBT inclusion or Gentile inclusion or some other topic? When major issues of theology or doctrine threaten division, is there a way forward? 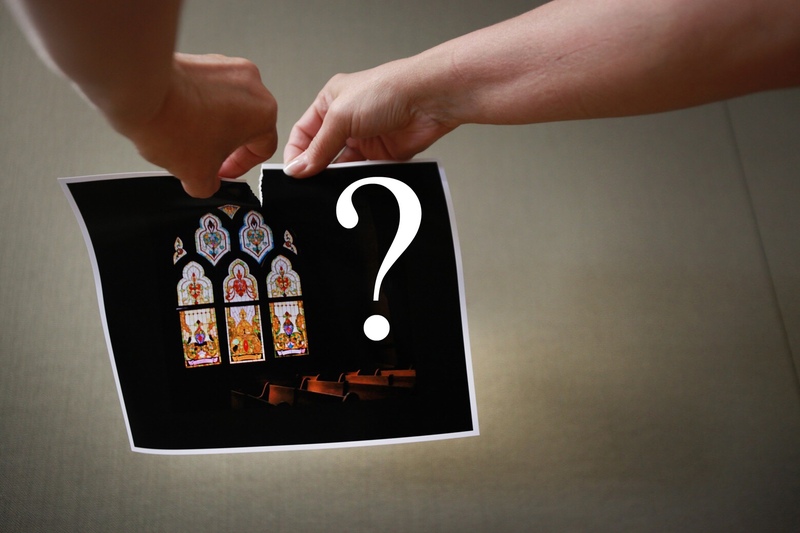 Specifically for us, is there a way forward for us as methodists even though good people disagree on whether or not the church should marry and ordain LGBT folks? To all that, Paul would say a resounding yes! Not to say that Paul takes a particular stance on the issue. In fact, Paul’s first letter to the church in Corinth is usually a focal point of scriptural debate about whether or not homosexuality is sinful. But Paul would say to us that we are all in Christ because we claim the name of Christ. That, by itself, for Paul, was enough to remain unified, regardless of the differences of opinion. Paul’s comments here were not without controversy, and Paul would have known that when he wrote them. He was a Jew himself, a pharisee in a former life, and understood the law and the implications for Jews everywhere of stating that Gentiles were now equal. Paul is also aware that there’s no uniform definition of what it means to be a Christian, so in declaring that all those “in Christ Jesus” are unified together as citizens and saints, no longer foreigners or strangers, is to declare loudly and boldly that none of the reasons for division in his time mattered. No status as Jew or Gentile, regardless of whether you followed the law or not, no matter if you adhered to temple worship or not; none of those reasons were reason enough to be divided from each other. And so Paul would say to us that none of our reasons for division are reason enough to divide. Paul declares in verses fifteen and sixteen that Jesus has “abolished the law with its commandments and ordinances, the he might create in himself one new humanity in place of the two, thus making peace, and might reconcile both groups to God in one body through the cross, thus putting to death that hostility through it.” While he wrote that comment for the division, and hostility, between Jews and Gentiles, we could put any two camps into that scripture. Jesus reconciles both groups, both traditionalists and progressives on the matter of LGBT inclusion, both those baptized as infants and those baptized as adults, both the baptists and the methodists, into one new one humanity, putting to death the hostility that existed before. This is not to say that the reasons for division don’t matter. This is not to say that the debates that persist don’t matter. They do matter. The hundreds of years old debate between predestination and free will, for example, matters. The millennia old debate about baptism matters. The decades old debate about full inclusion of LGBT individuals matters. These are things that really matter, just as the debate about full inclusion of Gentiles mattered in Paul’s day. These issues, these debates, have real world implications for our faith and for our mission. But they do not matter enough to divide us. For Paul, debate was a worthy endeavor. It’s part of why he wrote his letters. He pushed his agenda, he argued for his beliefs, he thought that he was right and he let others know that. This caused debate, even heated debate. This threatened division between himself and Apollos and Peter. But Paul also sought to keep talking with Apollos, Peter, and others who disagreed with him. If a church he founded went a different direction than he thought appropriate, such as the churches in Galatia, he didn’t turn his back declaring his righteousness, he wrote to them, he went and visited them, and argued his point. In short, Paul didn’t divide; instead, he kept talking. And that’s the task for us. Paul here, and scripture as a whole, makes clear that division is not God’s way forward. The church universal, the United Methodist Church, and even our congregation will get some things wrong. We will hold wrong beliefs. We will commit, as a body, sinful actions. Other churches and denominations will and currently do the same. That’s part of being human. We are all a mixture of light and darkness, sin and good, and as such, our churches are that same mixture of good and evil. But none of it is reason to divide. For Christ has abolished all the rules and regulations we might place upon ourselves to, instead, unite us into one common temple. That temple, the one into which all who are “in Christ Jesus” are being built, has a ring in the middle of it with signs posted on columns. But instead of that fence declaring that Gentiles enter under pain of death, it says in Greek and Latin; German, Swahili, Mandarin, Farsi, and Spanish; and indeed, in the official languages of The United Methodist Church in Portuguese, Kiswahili, English, and French, “welcome, all who confess the name of Jesus Christ, to the household of God.” That’s God’s vision of our future. Unity comes not through watering down our beliefs. It doesn’t come through flippantly saying all you need is love. It doesn’t come from finding the lowest common denominator. Instead, unity comes from believing in the highest rationale of all: that Christ died for us and rose on the third day. If we all confess the name of Jesus Christ, we’re united together. We’ll have disagreements, even strong ones; we’ll argue and fight and even get personal in our attacks sometimes; we’ll sin and we’ll be downright mean on occasion and then forgive, but we’ll be together, a household of God, being built “upon the foundation of the apostles and prophets, with Christ Jesus himself as the cornerstone,” as verse 20 elegantly puts it. The mission to which we are called, to spread the gospel and make the world look more like heaven, is a common mission regardless of our beliefs about baptism, theology, church structure, or even LGBT inclusion. Let us be bold in declaring our position for unity. Those attending other churches this morning in this community are citizens and saints, just as we are. Christians who declare things that make our stomachs churn because they so deeply offend are citizens and saints, just as we are. Members of churches who do strange things that seem to defy decorum and good sense are citizens and saints, just as we are. Churches that fully include LGBT individuals are full of citizens and saints, just as we are, just as all who gather in churches, confessing the name of Christ, but believing differently than us are citizens and saints, just as we are. Paul declares boldly in verse 21 and 22: “In [Christ] the whole structure [of the temple] is joined together and grows into a holy temple in the Lord, in whom you also are built together spiritually into a dwelling place for God.” That’s us, that’s everyone who claims the name of Christ. So keep talking. Keep arguing. Keep debating. Don’t get personal or mean or attack. But keep talking, keep asking questions, keep wondering, for that is the foundation of unity. Let us never allow those debates to be reasons for division between us and other Christians. Let us never allow our denominational debate about LGBT inclusion to divide us from each other. So long as we are willing to keep talking, mindful that we are citizens and saints together with who call on the name of Christ Jesus, we will discover the unity we so strongly desire. Christ calls us to unity. We are one body, being built into one temple. We have a duty, an obligation, a holy mission, to act for unity. Let us call upon The United Methodist Church to stay together, to keep debating full inclusion of LGBT individuals, even if it makes us unsettled, because only through continuing to debate, only through continuing conversation, can we find our way forward. All you need is Christ. And, in the end, Christ is the love that will cover over our multitude of sinful divisions. Let it be so. In our lifetimes, may we experience the unity of the household of God.